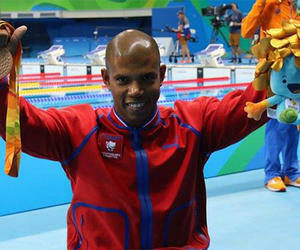 The swimmer Lorenzo Perez won the sixth bronze medal for Cuba in the 15th Paralympic Games, held in this city, but he still has an opportunity to get a crown for the first at this level. With his personal best of 5: 14.44 minutes, Perez, paraplegic athlete, achieved an excellent third seat in the men´s 400m freestyle S-6. I wanted the gold medal because I hope to improve my performance in London 2012, but I'm proud of this medal for the Cuban people who much support me, he said in the Olympic Park Aquatic Stadium. The event was won by Italian Francesco Bocciardo (5:02.07) who was escorted by Dutch Thijs van Hofweegen (5:07.82).